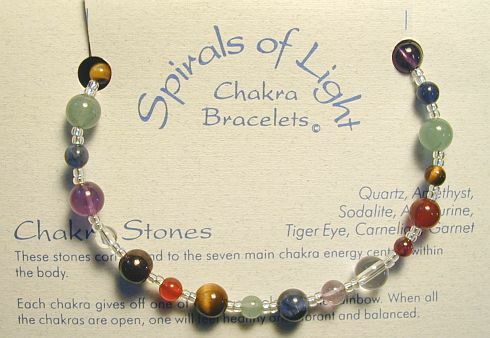 Chakra Stones: (Quartz, Amethyst, Sodalite, Aventurine, Tiger Eye, Carnelian & Garnet.) These stones correspond to the seven main chakra energy centers within the body. Each chakra gives off one of the seven colors of the rainbow. When all the chakras are open, one will feel healthy and vibrant and balanced.